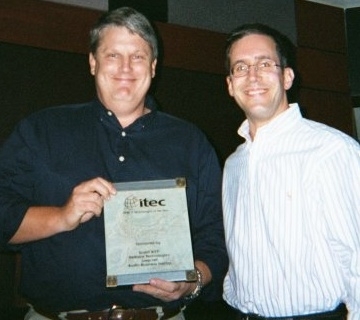 On November 8, 2000, the Austin chapter of the Association of Information Technology Professionals (AITP) presented the third annual Austin IT Executive of the Year Awards in conjunction with the ITEC Expo - the region's largest gathering of IT executives, educators & vendors. 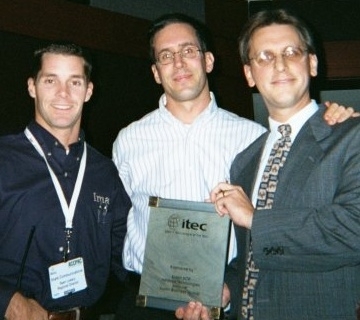 The ITEC/AITP awards ceremony was held at the Austin Convention Center, and it was attended by over one hundred area IT professionals. "This event is the highlight of the year for the growing IT community in Austin," said AITP president, Jonathan Hines. "We're proud to honor top-notch IT professionals such as Treg Russell and Hayden Steward who greatly contribute to the success of the numerous technology companies in our community." The primary sponsor of the event was Networker.com. Two major awards were presented: The Austin IT Executive of the Year, and The Austin Information Technologist of the Year. TMLT decided to utilize web technology in an effort to make courses more convenient for their client physicians to access. Treg has been instrumental in the development of a web based course delivery engine which has since been marketed to other companies. Profit from this system has supported all web development at TMLT for almost two years. Companies that have purchased and are utilizing this system include the UT system, the Department of Defense, the Texas Restaurant Association, and a number of school districts. Runner-up for the award was Mike Sigman, Director, Information Technology for International Sematech. Hayden directed the team responsible for re-architecting the client/server-based Tivoli enterprise product suite to make it operate in a multi-customer ASP environment. Hayden keeps the TriActive Systems Manager development team focused on features that will bring value to the mid-market - features that enable their customers to become proactive forces within their organizations. He directed the TriActive development team in creating a common user interface that integrates access to all the applications, giving IT customers the benefits of rapid implementation and rapid proficiency. Stewart also works closely with TriActive beta customers and early-adopter LightHouse customers to prioritize the product development roadmap. "TriActive is fortunate to have an experienced and focused leader like Hayden on our team," said Glyn Meek, TriActive President and Chief Executive Officer. "It's quite an achievement for Hayden to be recognized as a leader within a community that is brimming with talented IT professionals." Runner-up for the award was Joe Bell, Senior eSolutions Architect for Concero. This year's recipients were chosen by Rob Adams, Founder and Managing Director of AV Labs, Sonia St. James, President and Chief Executive Officer of the Technical Busisiness Network, and Jeff Tyler, Chief Information Officer of Collective Technologies.